Sure, you've got your Hipstamatic filters and your ProCamera bag of tricks. 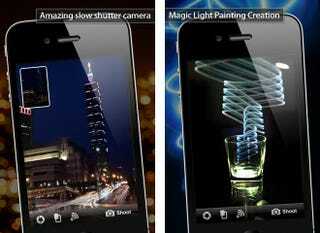 But to capture truly ethereal slow-shutter speed shots and lithe light paintings, you're going to need Magic Shutter. It looks pretty amazing, and amazingly pretty. You can choose among front and rear-curtain sync effects in flash modes, meaning that the blur effect either tails or leads the sharp image. It's a creative blend of the iPhone's video and still camera, and may just elevate the app camera effects game from "hipster art" to "art art."